Our next major update is scheduled for March 5th, that should give plenty of time to catch up on your Bingo scores. This week’s maintenance will occur at a much earlier time. 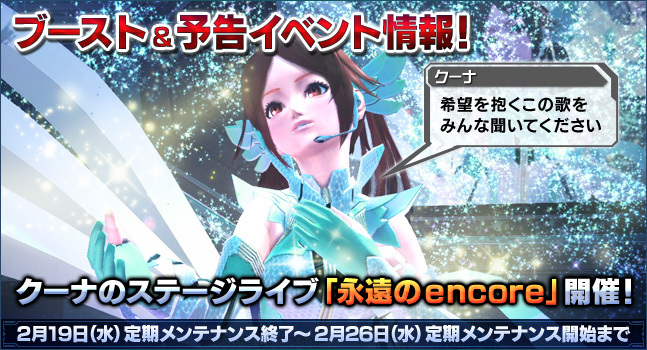 PSO2 Live Stream #16’s Secret Phrase items have been distributed. Client Order Campaign #42 items have been distributed. Boost event and campaign information will be posted during and after maintenance. Sega plans to add the HP and PP ability affixers to the next scratch. Sega has confirmed a bug where the effects of certain skills and such causes certain technics to not consume PP. Sega plans to correct this bug in the future. Sega plans to adjust the lengths of the Long Fishnet Stockings. You can expect the changes listed above in a future, unspecified update. Based on the schedule below, Raging Dark Arms or Mining Defense will appear 30 minutes after every live concert. Boost Days apply 0:00 ~ 23:59 JST on the specified day. Click on the pink links for timezone conversions.